At first viewing, Clements Siatous’ paintings can be interpreted as blissful, serene tropical landscapes. A bygone time, the paintings depict a small village of huts, roaming chickens, fishermen loading boats and women processing coconuts. Scenes filled with coconut trees, blue skies and oceans, the brilliant green and yellow fauna and exquisite light reflecting off exotic waters. Bright colours that portray a tropical paradise – painted so intensely and vividly that the scenes almost appear dreamlike. One could naively interpret the paintings as tropical souvenirs, but within the striking beauty of the canvas lays the haunting truth of Siatous’ autobiographical works. Each painting is an act of rebellion that represents the collective voice of an entire generation and culture. Clement Siatous was born in 1947 on the Chagos Archipelago islands. Located in the center of the Indian Ocean they are some of the most isolated and beautiful islands in the world. The Chagos population was originally brought to the islands as indentured laborers to work on coconut plantations. Inhabiting the islands since 1776, they formed a unique, rich and deeply rooted inter-island culture, called Ilois, a French Creole word meaning Islanders. That is up until their forced deportation that began in 1968. Clement spent most of his childhood on the main island, Diego Garcia. In 1968, the year the forced deportation began, Clement traveled to Mauritius along with his mother to receive medical treatment. When they tried to return home to Diego Garcia, they were told the island was ‘sold’ and that it had been ‘closed’. The entire population of over 2,000 inhabitants was forcibly displaced from their homeland by the British Government to make way for a U.S. Naval base, which remains to this day. Clement, along with many Chagossians, was exiled in Mauritius. His family separated and impoverished, life was extremely difficult as they struggled to survive and integrate with Mauritian society. Uprooted from their way of life and left without any means to survive, many Chagossians died from what the community call Sagren, a Creole term to describe the physical and mental condition of profound sorrow. Sagren has come to embody the current psychological condition of Chagossians today, a constant state of longing to return to their homeland and to a better prosperous way of life. Out-sider art is often defined as self taught and living on the periphery of society and on the fringe of an artistic establishment. By definition outsider artists are marginalised by race, history, socio economics, or isolation. Much of this is true of Clement Siatous, who has only known abject poverty and lived on the periphery of Mauritian society. He has always had a natural skill for drawing and some of his fondest memories of his childhood were sketching the fauna on Diego Garcia. This lived memory is evident in the vibrancy and detail in the paintings today. Having not painted since he was a child, Clement began again in 1995 in direct response to the U.K. Government’s continual denial that there was ever an established population living on the islands. His work attempts to render a reality of his people in the face of government denial. The only sparse photographic evidence of the Chagos Islands primarily exists in military and government archives. Sadly, people outside of their community, like anthropologists, historians and journalists are often the keepers of their history. As was the case with many Chagossians with the forced eviction everything was left behind. Clement had no photos or belongings by which to remember or anchor his heritage. Without any access to photos or family heirlooms, Chagossians have no access to their own history. Clement began painting as a way to share his memories and to make his life on Diego Garcia tangible. Working with acrylic paint on canvas and the color palette of the Indian Ocean, Clement paints scenes illustrating life on the Chagos Islands. As a self-taught artist, he describes his art as ‘self imagination’. In each canvas history and memory collide, his paintings offering a counter-point to the military record told through a colonizing lens. Dating each of his paintings back to his recollections, Clement defiantly paints through the fog of memory and imagination in order to claim ownership of his own history. Clement Siatous, Scene De la vie quotidienne a la ville de Perhos Banhos, 1950; acrylic on canvas – image courtesy the artist. In ‘Plagede Perhos Banhos,’ 1954, Clement paints a bustling scene portraying island life in descriptive detail, from the local village and homes to the copra and fishing industries. In contrast to the limited black and white photos he has to reference, Clement’s scenes are colourful, evocative expressions of a remembered time. 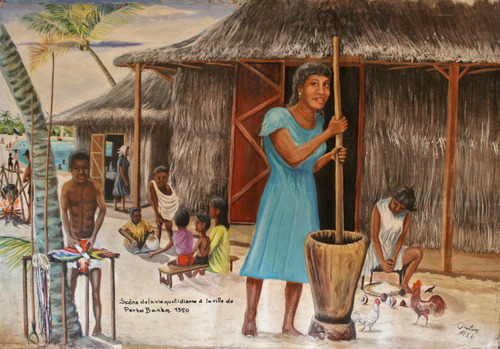 The paintings also show the Chagossian culture and food with great accuracy, as in ‘Scene De la vie quotidienne a la ville de Perhos Banhos,’ 1950, which illustrates fish and coconut preparation with traditional island tools. In other paintings, traditional woven baskets, hand-made fishing boats, harvesting tools and different stages of the copra industry are portrayed. Clement Siatous, Grandes Cases de Perhos Banhos 1950 & Bureau Abandonnes en, 1973 jusquite; acrylic on canvas – image courtesy the artist. A solemn scene in ‘Grandes Cases de Perhos Banhos 1950 & Bureau Abandonnes en, 1973 jusquite,’ interrupts the series of lively paintings. Here, two Chagossian eras are represented together; a bustling scene with figures going about their daily errands in contrast to an empty building abandoned and left to decay. Clement Siatous, Dernier Voyage des Chagossians & bord du Nordver enrade Diego Garcia, 1973; acrylic on canvas – image courtesy the artist. 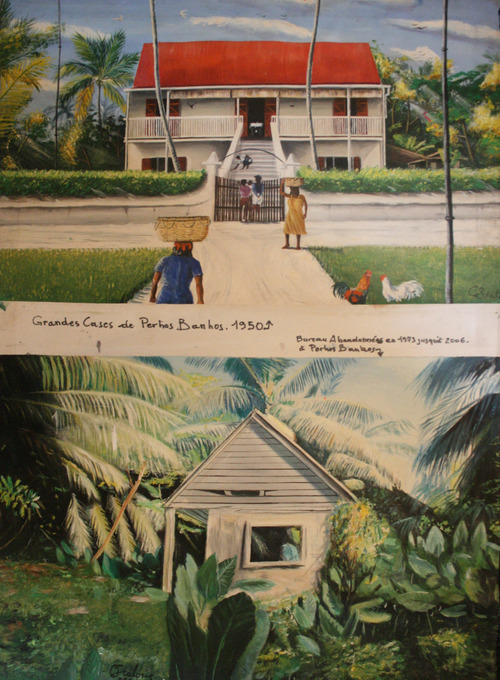 In ‘Dernier Voyage des Chagossians & bord du Nordver en rade Diego Garcia,’ 1973, Clement depicts the actual eviction and final deportation of the Chagossians. 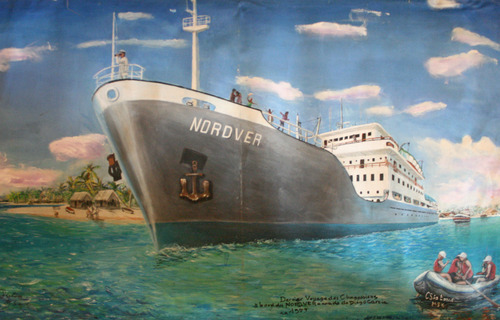 A difficult and emotional moment to capture, the painting manages to encapsulate the narrative of the eviction: the empty village lies behind a looming boat called the Nordver carrying distraught Chagossians, the naval personnel with their backs turned away, a metaphor for what was to come for the Chagossians.